Automatic Under-Bobbin/Dental Floss Winder(TN-09S-C) - Taining Machine Industries Co., Ltd. Adjusting the tension individually which are provided on each spindle to meet the unique thread tension weight. 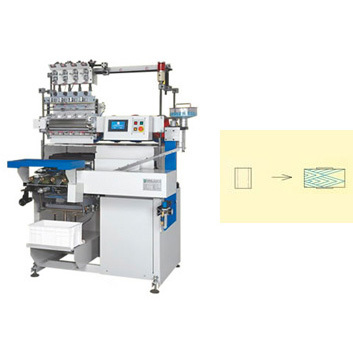 Gradually reduced tension device to keep the constant thread tension presented during winding and increasing the package diameter, thus the ideal package shapes to ensured. To meet the requirement of starting and doffing, it is equipped with bobbin magazine for empty bobbin. With oiling device for lubrication the thread. The rotating speed of oiling roll are adjustable and which are controlled by switch on the control panel. Automatically doffing to be controlled by the pneumatic system. Electronic counter activates to stop the machine and then doffing when the predetermined length has been wound up. Adjust the speed of oiling roll and controlling the temperature of oiling bath in case of the heater is equipped dextrally. Check the air working pressure. Just turning the knob by hand to adjust the density the thread wound up for the different yarn type, to meet the nice looking appearance of shapes.